These notes accompany a in-depth feature on South Africa 2010. For profiles of all 30 estates visited please see Regional report: South Africa 2010. 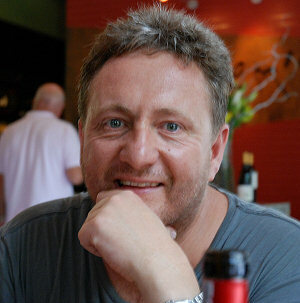 Marc Kent (right) is one of the most restless and adventurous winemakers in the Cape. His operation spans everything from the hugely successful Porcupine Ridge range of superior supermarket wines made from bought-in fruit, to his estate-grown Semillon, an esoteric white-Bordeaux lookalike that is one of South Africa’s best and most expensive white wines. He recently surprised with his bottling of a very cool-climate Syrah from coastal vineyards in Walker Bay, and on this visit enthused about an organically accredited vineyard he had just acquired in Reibeek, Swartland, that supplied the Syrah fruit for the first few vintages of Columella. His hugely successful Chocolate Block – a rich and spicy melange of Syrah and a fistful of other varieties – is as cleverly marketed as it is simply brilliant to drink. Current release. Beautiful seed cake nose, touches of lanolin and a definite waxiness. Sweet edged palate, terrific acidity, tight lemony flavours, but needs time. 91 points now, but try in a few years. Two barrel production, spending two years in new wood. “Complete take on Semillon,” says Marc, with 165g/l of residual sugar. Wonderfully opulent nose, with huge honey and sesame seed notes. Beautiful balance, with subtle honey and leaf tea notes, a touch of Earl Grey. Fabulous clarity in the finish, with lovely balance, the clear, glycerine and lemon confit fruit extending through the finish. 93/100. 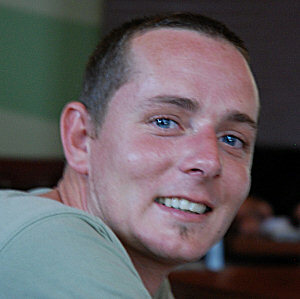 Gottfried Mocke is the youthful-looking winemaker who in fact has been with Chamonix for nine years. The Chamonix farm extends to 300 hectares, though only 50 hectare are planted to vineyard. 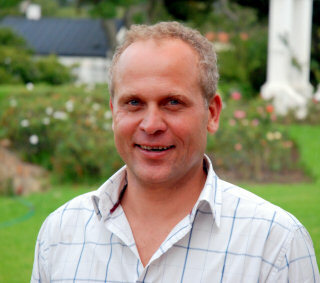 But even there, Gottfried has been ringing the changes: “We’re moving away from ‘fruit salad’ vineyards featuring lots of different varieties planted on the valley floor, and moving up the hillsides.” Today his Pinot Noir comes from some of the highest sites in Franschhoek at 600 metres, whilst Sauvignon Blanc and Chardonnay are at 450 metres. Soils vary, with greywacke-rich soils for Sauvignon: greywacke is rounded, river-polished sandstone also very common in the Sauvignon vineyards of New Zealand. Gottfried says he practices natural winemaking, with all natural yeasts for fermentation whilst they are in transition to organic farming. Along with several other estates in the Cape, Chamonix uses a percentage of concrete ‘eggs’ for fermentation. 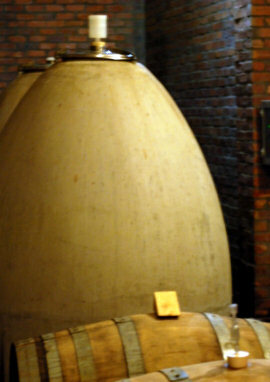 The concrete is a very stable material for wine fermentation, and the egg shape is said to keep the lees in suspension longer (so requiring less stirring of the lees) and leads to a smoother fermentation pattern because the maintains the most even temperature throughout the vessel. They are now quite widespread around the wine-making world, already in use in Bordeaux Château. Pontet-Canet, and under consideration for the new cellars at Cheval Blanc. Fascinating herby nose, not green but with dill and lemon thyme notes, lots of zesty lemon. The palate shows really bold, punchy, zest and citrus peel fruit and acidity. Very clear finish, with a cool, long, shimmering quality. 92/100. £11.00, Stone Vine Sun, Vine King, Swig. Bellingham estate was established 1693, whilst Boschendal can trace its historic farm and homestead back even further to 1685, though today both are part of the same group – Douglas Green Bellingham (DGB). I met up with Group Winemaker JC Bekker first at Boschendal for a tour and tasting, then later for dinner at the Boschendal estate’s beautiful Manor House. JC is at pains to point out that innovation is part of the Bellingham philosophy: they were the first to plant Roussanne and Marsanne in the Cape for example, and for their Bernard Series have created a ‘winery within a winery’ featuring sorting tables and open fermentation tanks. JC also says his goal with both estates is to achieve suppleness. His aim is “Eliminating the green and avoiding aggressive tannins,” and achieving this, he says, is mostly down to terroir: “Especially with Pinotage we need to find the right sites to avoid the unpleasant notes that people don’t like. For us that’s the Simonsberg foothills – the best Pinotage comes from there I have absolutely no doubt, and it all about the site.” This, he says, as a perfect example of the changes the Cape has seen in recent years: “Five years ago everyone was talking about the winemaking being the secret to Pinotage, nobody talked about the vineyards and sites.” Boschendal has recently purchased Brampton brand from Rustenburg: “it was getting too big for them,” says JC. They have bought the brand and vineyard contracts. 60/40 blend of the two grapes, 10% aged in older barrels. JC says this is the oldest Viognier in South Africa at 11 years old. Talcumy, slightly sherbetty nose, with some herbal aromatics. Very attractive sweet fruit on the palate, the texture is creamy without being too full, and the lime acidity streaks through the finish beautifully. 89/100. Sainsbury’s looking at this, but not currently in stock. Fermented in barrel, natural yeasts. Eleven year old vineyard. Hugely aromatic Viognier expression, with lots of sweet, unctuous nectarine and pear, with a smattering of vanilla and honey. Very sweet fruit, with lots of unctuous character, but not heavy or cloying. Lovely style and expression. 89/100. £8.99, Waitrose. 40-year-old, dry-farmed bush vines that yield very low. Twelve months in barrel, 50% new. Fairly subdued apple nose, seems a little bit dumb at first, but then some honey richness and toast coming through as well as peachy fruit. Obvious concentration on the palate, with a broad acidity and a great core of orange and toast building. The palate has a natural concentration that is quite decisive, with that fat, tangy, lemon zest and green apple acidity playing against a hint of sweetness. 90/100. Waitrose. From three selected parcels of old bush vine Pinotage in Stellenbosch, 12 months in barrel, new and second fill. Pinotage signature, just hinting at the burnt/rubbery quality, but leathery, moving into blue/black fruit. The palate has a massive black fruit presence. There’s huge, almost floral character here. The palate too is filled with lots of silky, sweet black fruit. Quite fine and racy too, with a long, dry finish revealing fine, but grippy tannin. 89/100. Not yet listed in the UK. Tank sample. A little more herbal, earthy character. The fruit is sweet, and the palate as a racier edge to it. There’s a juicer, more quenching quality to it. There’s a chocolate and mocha richness. 88/100. See all Bellingham stockists on wine-searcher. Herbaceous, gooseberry and nettle character, with a background of powerful tropical fruit coming through. The palate has a big tropical burst, hints at a smokiness, but the big, sweet, tropical fruit palate. Good acidity, and an impressive commercial style. 86/100. Sainsbury’s, Tesco. 70% barrel ferment. Quite a big, oaky nose. Quite buttery and vanillin, with a nicely buttery, fat but clean and citrussy. Tangy and long, with a touch of sweetness and vanilla in the finish. 86/100. A very pale rose. Whole bunch pressed. Delicately fragranced, but quite muted nose. A little lemon sherbet and a touch of something strawberryish. The palate is fresh and tangy, with a savoury minerality and decent length. 87/100. 85% in barrels. Very chocolaty and spicy, with a bold, very peppery notes. Very violetty and lifted. The palate has a fine intensity, particularly rich, opulent and chocolaty with masses of sweet fruit. A lovely wine at the price. 88/100. 100% barrel aged for 18 months, from a single vineyard. Huge, bold, beetroot and Italian tomato nose of ripeness. Plenty of black fruit. The sweetness of the fruit comes through nicely, with a silky maturity to the tannins and quite a chocolaty depth, with a spicy plum roughening edge. 89/100. £9.99. 60% Cabernet Franc, Cabernet Sauvignon, merlot given 24 months in oak. Nicely lifted, clove and smoky, fragrant sandalwood notes and lovely sweet cassis and glossy black plum fruit. Terrific fruit on the palate, real sweetness and plush, silky tannins. Very soft finish, with smoothness and lovely balance. 91/100. Bold, lightly gamy nose. Fine aromas, a little bit of that tomato leaf character and lots of ripeness. Plenty of charry and spicy notes. The palate is quite lean and savoury. The tannins are liquoricy and tight, the plum skin bite adds a tightness. The finish has a nice freshness, with good acidity, spice and a warming but maintains its edge. 88/100.